The Brain Showsm is taking the country by storm. 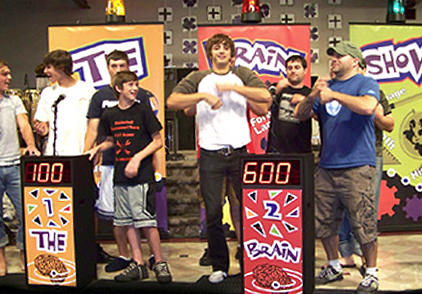 This interactive game show, which is a big hit with all ages, offers authentic fun and excitement of a real live TV game show including colorful podiums featuring computerized lights and sounds. The Brain Showsm is currently presented in a number of different entertainment venues including camps, theme parks, resorts and party halls. It’s the perfect compliment to any entertainment package. Because The Brain Showsm is easy to set up and costs little to stage compared to other live performance shows, it is a popular choice among entertainment companies. The Best Live Performace All-Age show!